I hope everyone enjoyed a fabulous and relaxing Mother’s Day Weekend and thanks to all who tune in each and every weekday at 8am to That Business Show with Jamie Meloni on 1250 WHNZ and also available via the iHeart Media app on your smart phone. We also have links to the audio/video via my site http://www.tampabayradio.com. On the first half of the show, I welcomed Gwynn Davey, Market President for Hillsborough County with Bay Cities Bank to discuss the banking/lending environment. Bay Cities Bank is a community bank that caters to small business owners and commercial real estate projects and was founded in November of 1999. Serving multiple locations around the Bay they are an excellent resource for SBA loans for the entrepreneur and invite you to reach out to them with your business plan to see if they can assist you. Gwynn and I touched on regulatory challenges within the industry including a brief discussion of the effects of the Dodd-Frank bill that was passed in 2010 that overhauled the banking industry as well as her and the bank’s community involvement. Contact Gwynn at 813-281-3483 or email at gdavey@bay-cities-bank.com for information on their lending programs for small business owners and commercial parcels and visit their website at http://www.bay-cities-bank.com for more information! 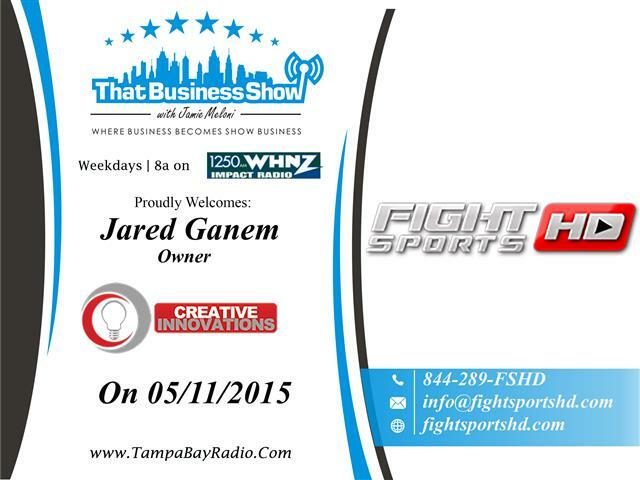 On the 2nd half of the show, I welcomed Jared Ganem, owner of FightSportsHD as well as Creative Innovations Video. Jared’s company specializes in live event video production and works with professional wrestling and MMA events through FightSportsHD but also serves the general community with Creative Innovations Video for people needing video production assistance. Their services include but are not limited to commercial, video editing, voice-overs, jumbotron and 2-D/3-D graphics. Jared also shows his story that inspired him to launch this business two years ago and some of the challenges he faced along the way. Jared’s involvement as an upcoming professional wrestler gave him the insight and experience and first hand knowledge of how to produce wrestling and MMA videos to get the best out of each event and how to transfer that experience to the audience through video. Learn more about Jared’s companies at http://www.fightsportshd.com and http://www.creativeinnovationsvideo.com and contact the company at 844-289-3743 for more information. Email is also available at info@fightsportshd.com and they are available to assist you with all your video needs!